For what’s probably the most evil-looking postage stamp ever printed since the USA rolled out the Universal Monsters series, the Portuguese Postal Service (Correios de Portugal) have chosen supreme gothic metal band Moonspell – namely their 1995 debut full-length album Wolfheart – as part of an official series honoring significant rock artists and events in that nation’s history. See the truly awesome artwork below the jump! 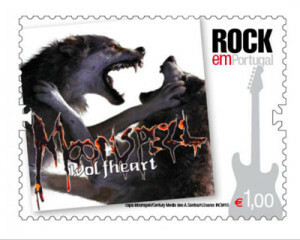 The Moonspell Wolfheart stamp (as well as the rest of the “Rock ’em Portugal” series), will be available throughout every Portuguese territory on July 19th, and can be purchased for 1 Euro each. The artwork chosen is from the album’s digipak release, instead of the original album cover (which kinda looks like a demonic version of the “Three Wolf Moon” t-shirt). “Being that the whole of our career kick-started as pen friends and tape-traders, we could not think of a more perfect and suitable distinction,” the band said in an announcement this week. They also updated their fans on the status of their next album, which is set for release early next year; the band promises fans “the most exciting, sexier, darker, heavier and catchier stuff we wrote in ages.” This week the band is also sharing the stage with Faith No More and Alice In Chains at Lisbon’s Optimus Alive festival.